There are only a handful of river names in the world - the Nile, Amazon, Mississippi - that share the mystique of The River Styx in North Central Florida, yet Styx is only a few miles long as is more of a swampy creek than a formidable river. It connects Newnan's Lake with Orange Lake, and passes through a superlative, high-quality cypress swamp forest. A friend and I paddle Styx on the day before the annoying Daylight Savings Time is to begin - thereby shutting off any meaningful, after-work, weekday outdoor adventure activities. The day we select turns out to be a beauty. Cool, partly cloudy, windless weather. One initial fear I have: Will we not be carried off by a black swarm of the feared Florida mosquito while paddling within a swamp? Fortunately, my fear does not materialize. While we do end up contending with a few of them blood-sucking bugs, there are not enough of them to obligate us to wear insect repellant (which was quite a relief, since I had somehow forgotten to bring along my Deet for the paddle). Our paddle is worthy of all one would hope for in a memorable experience of the "real Florida," as they say. Low exertion, given the lazy-ness of the river current and the short distance we needed to paddle. Very quiet, except for the brief encounter near the end of our trip with those enraging, obnoxious Orange Lake Air Boats. Very pretty, given the healthy cypress swamp we winded through, and the wood storks and hawks we see. And very off-to-ourselves, due to our having the River Styx to ourselves. The State of Florida has acknowledged the special quality of the River Styx by naming it an "Outstanding Florida Water" (only 40 out of the 1,700 rivers in Florida have been so named - named as a result of their pristine qualities). 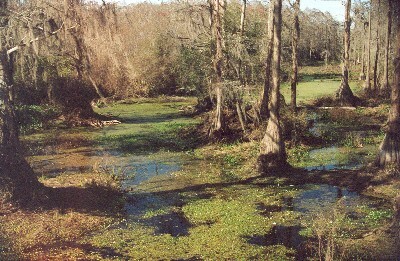 The upstream paddle puts one into the heart of the cypress swamp, which eventually becomes an impenetrable River cul-de-sac requiring us to turn back. Heading downstream, we find ourselves in a more open setting. Occasionally, we startle a large alligator, which dives to the bottom with a terrifically startling splash as the beast notices our approach. Soon, the River Styx opens up into Orange Lake, historically a bass fisherman's paradise. The lake is quite large and today contains a large number of floating islands. Along the way, I feel I am in a sacred location, given the lack of development, boats, noise (and presence of a beautiful swamp). As a result, we speak in humbled, hushed tones, if at all, as we take in the glorious-ness of it all. I remark that "it doesn't get much better than this." My companion points out, as we reach a dead end, that this is his favorite location in all of Alachua County.